This controversial argument has raised its ugly head in Northland once again. "Get all these logging trucks off the road" is the catch cry. This argument will be raging all over New Zealand as different forestry blocks become available for harvest. In the last few months, New Zealand Rail has made the decision to close the Otiria rail line, in behind Moerewa on State Highway 1 to the central railhead in Whangarei and then out to Portland Pulp Mill. Coupled with this, over the past month, we have had five logging truck accidents here in the north, mostly attributed to speed or driver error. Locals affected by logging truck congestion on their roads, and those with their own agenda to push, called a meeting last week to discuss the issue. After notification from the boss (The Ed) that this was happening, I took myself off to the meeting to get a feel for what was going on. Within 45 minutes, I was disgusted with this meeting and the way it was controlled by the chair. In my opinion, the chairperson had his own agenda to push and try to push it he did, showing total disrespect for the other five invited members on the panel. The invited representatives were a member from the regional council, the head of the police traffic unit, a representative from MTSA, a local politician, and a union representative. The chairperson represented the railways union. This was meant to be a public meeting but members of the trucking community were not invited, so there was never going to be balance, as those who were present did not include all involved to fully discuss a solution to the problem. The general public immediately affected by the logging truck volumes quickly disorientated the meeting by pushing their own agenda and opinion as to a solution. By then, my thoughts were that this meeting would probably continue for another couple of hours and a lot of hot air and anger would be vented. Finally, there would not be a resolution reached because not one person there was able to generalise the total situation to a rightful conclusion. So, the facts as I see them, is that forestry and logging are here to stay, because it is our third biggest industry in New Zealand. It creates jobs and income for every province in the country, so it would be naïve to think otherwise. There will always be logging trucks on the road. Logging trucks were using roads before people decided to live on lifestyle blocks. Those that now want logging trucks off the road and deliver to railheads are dreamers. While waiting for the meeting to start, someone had set up a projector showing slides of crashed logging trucks and a few statistics of one thing or another. One of these slides stuck out more than the others and rang a big bell in my head. It showed a picture of the train from Murapara loaded with logs heading to Mount Manganui. The caption underneath stated that this train took 165 trucks off the road every day. Absolute rubbish, whatever ends up on the back of a train was delivered to the railhead by truck! I drove one of those trucks to the Murapara rail every day for many months in the ’70s. 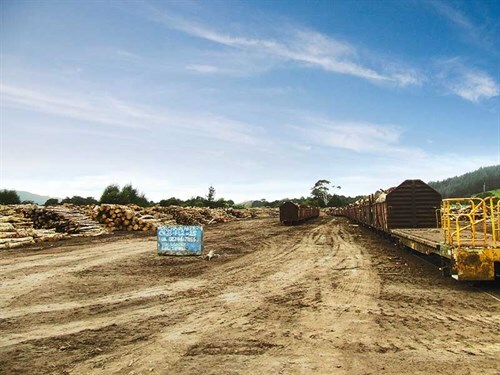 The only difference between the central North Island and Northland is that the forestry companies have off-highway roads going to the railhead in Murapara, to the mills in Taupo, and to the pulp mills in Kawerau and Kinleith. Those same trucks will also travel on State Highways as well. Northland forestry in comparison to the central North Island is relatively young with many of the forests not having come on stream until the ’80s and ’90s. Northland forests are landlocked by farms, so an option for off-highway roads is not viable. The Northland roads were never designed for heavy logging truck use every day. So who is responsible for that? Not the local governments. Central Government encouraged the planting of Radiata pines all over New Zealand. Did they stop and think of the consequences when all this wood became available for harvest? Those who travel around this beautiful country of ours on the back roads know these roads were built years ago and were not designed to carry the volume of freight that is expected today. In fact, there used to be classification of roads; class one, class two and class three. This restricted the use of trucks on those roads by their weight. These classifications have been thrown out the back door in the pursuit of money. A huge percentage of these roads have never been upgraded and are literally falling apart with the volume of freight travelling over them. I have digressed a bit from the real reason of this article, Unfortunately, there is no easy straightforward cure to the problem. If you take the trucks off one road because of congestion and send them on a different route, you are just sending the problem to another area. Sending trucks to the railheads when there are no off-highway roads for them to use, is also sending the volume of trucks onto the available roads, to annoy the locals in that area. 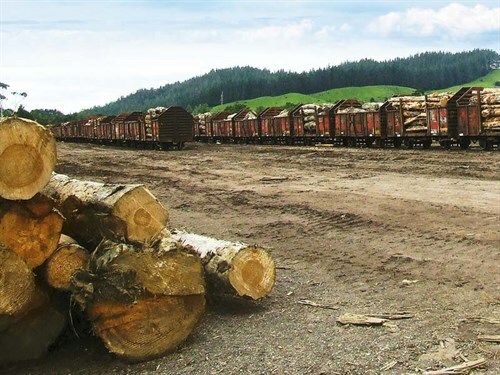 If the trains cart a million tonnes of wood to whatever destination, then the trucks have first carted a million tonnes of wood over Northland roads to deliver the wood to the railhead. My gut feeling, before walking out on an angry meeting, was that no one there was prepared to look at the industry as a whole, nor come up with a management programme that will keep all those affected by logging in their community safe. As alluded to in my last article, it all comes down to money. Cartage rates are screwed down to the eyeballs, trucking companies are working for tighter and tighter margins and driver’s wages in Northland are reputed to be lower than elsewhere in the country. Will this ever change? Probably not. The fact remains we do have a problem. There is no quick fix, but a fix is required to appease all those affected.